As discussed last time, having a clear understanding of the thing being changed is key to understanding how to change it. Given that, this post will focus on creating a common framework for understanding the “Change-ee” systems. To be clear, the primary subject of this discussion are software application systems. That should be obvious from the DevOps discussion, but I prefer not to assume things. 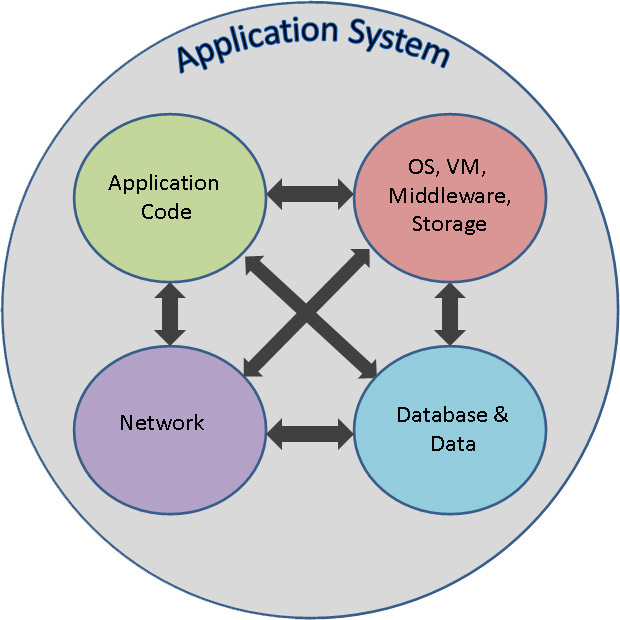 Application systems generally have four main types of components. First, and most obviously, is the software code. That is often referred to as the “application”. However, as the DevOps movement has long held, that is a rather narrow definition of things. The software code can not run by itself in a standalone vacuum. That is why these posts refer to an application *system* rather than just an application. The other three parts of the equation are the database, the server infrastructure and the network insfrastructure. It takes all four of these areas working together for an application system to function. Since these four areas will frame the discussion going forward, we need to have a common understanding about what is in each. It is important to understand that there are variants of each of these components as changes are applied and qualified for use in the production environment. In other words, there will be sub-production environments that have to have representative configurations. And those have to be considered when deciding how to apply changes through the environment. Application Code – This is the set of functionality defined by the business case that justifies the existance of the application system in the first place and consists of the artifacts created by the development team for the solution including things such as server code, user interface artifacts, business rules, etc. Database & Data – This is the data structure required for the application to run. This area includes all data-related artifacts, whether they are associated with a traditional RDBMS, “no sql” system, or just flat files. This includes data, data definition structures (eg schema), test datasets, and so forth. Server Infrastructure (OS, VM, Middleware, Storage) – This represents the services and libraries required for the application to run. A broad category ranging from the VM/OS layer all the way through the various middleware layers and libraries on which the application depends. This area also includes storage for the database area. The complicating factor for these four areas is that there are multiple instances of each of them that exist in an organization at any given time. And those multiple instances may be at different revision levels. Dealing with that is a discussion unto itself, but is no less critical to understanding the requirements for a system to manage your application system. The next post will examine this aspect of things and the challenges associated with it.